I can't seem to settle on a topic today, so here are four quick things I've been thinking about. 1) I ran a really nice workout today. For the first time in a while, I didn't run it solo. I ran 800s with a buddy, and we traded the lead on each interval. After the 800s, we ran some 200s, and I surprised myself by finding some speed in these older legs, hitting 28s on a couple. The track is public, and there were some kids out playing soccer watching us old guys hammer around the track. One of them, a 16 year old, jumped in and tried to hang for one lap of one of the 800s, and he only kept contact for about 100 meters. I guess that made me appreciate the gift of being fast and strong. Spiked up and psyched up, baby! 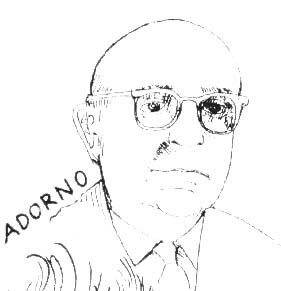 2) I have been reading some Adorno, just snatches here and there from Negative Dialectics. He's good for a pragmatist like me to read, because he reminds us that the task of a philosopher is not always to connect with culture; sometimes we have a duty to be misunderstood--especially when dominant forms of understanding are totally whacked. It takes courage to persistently seek misunderstanding. 3) A recurrent theme of this blog is the idea of reconnecting with experience through the organizing practice of running. I guess I am sort of discovering that this is the problem I am most interested in as a philosopher. It came up today in a conversation with a student. I only know how to put the claim in a grandiose way: it seems like the problem of contemporary, American, 21st century life, is the difficulty of even having an experience at all. Isn't this what we mean by the term "depression"--the fact that experience seems to come at us through a sort of gauzy haze, or does not even come at all? frustrated, tedious, delayed, deferred. At his best, he made these qualities magical. As you probably know, he was clinically depressed and killed himself a few years back. 4) If you have an hour on your hands, I highly recommend this documentary featuring the Irish miler Eamon Coughlin in Iten, Kenya looking at the reasons behind Kenyan running success. Man On A Mission from jamieleedalton on Vimeo. A - Alignment - what you might call "body focus"
The video is very well done, and it is easy to see why the Kenyan athletes excel. It's also easy to see what makes Colm O'Connell a great coach; he instills calm confidence into his athletes and understands how to keep his athletes focused on the simple qualities of excellence. Thanks. I read this last night, before this morning's 200s. One of the coolest things about track is the tremendous significance of a few seconds. Each one is an eternity, containing important hundredths of a second in it. To think that the difference between 28s and 35s is "equivalent*" to the difference between 15:45 and 20:00 for the 5k, and between 2:30 and 3:15 for the marathon. 7 seconds! *Footnote nod to DFW(+): I know there are a multitude of other factors($). Please. ($) speed, endurance, strength, workout paces being compared with race times, etc., etc., etc. Ha, love the footnote nod. Yeah, the greatest, I don't know, but maybe... lots of unfulfilled potential there. Also: you are not a 20:00 5k guy, and I am not a 2:30 marathoner. But yeah, that's what's cool about the track. Yesterday, we were just nailing the splits, cranking out 75s over and over again. It's kind of amazing when you stop to think about it. "It takes courage to persistently seek misunderstanding." so, you are seeking misunderstanding, eh? Sometimes you seek misunderstanding, and sometimes it seeks you. Awesome documentary. I always love inspirational stuff like this. Rudisha performed well recently. Enjoy the miles, great blog! Hey Mike, thanks for the comment. Rudisha is a stud. Excited to see what happens in the Olympics. It says that I need permission and a password to watch the private video. How do I get that? Not sure what you can do, sorry about that. Probably a copyright issue.